Lemon Cucumbers are small, round and yellow with a bright, sweet flavor that traditional cucumbers lack. Lemon Cucumbers are small, round and yellow with a bright, sweet flavor that traditional cucumbers lack. With a thin skin and unique shape they can be eaten just like an apple. Add color to your garden and your table; try them sliced, in salads or in cold water as a refreshing drink. 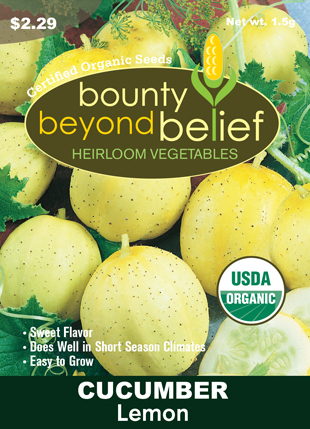 Easy to grow and prolific, this heirloom variety is great for areas with short growing seasons.